How Mad Can a Mad Hatter Get? We're all familiar with the expression 'as mad as a hatter', but has anyone ever really looked into the whole hatter/madness thing and produced some hard evidence? 'I'm feeling much better now, thank you very much'. 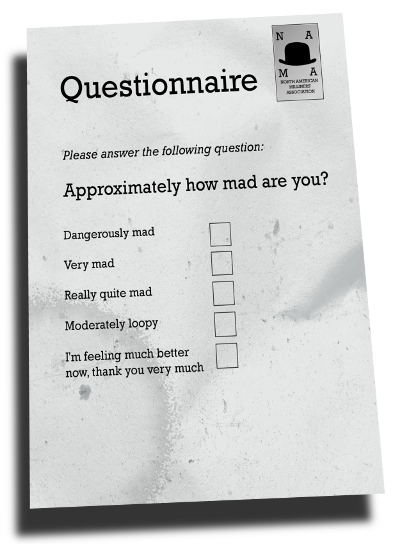 When the questionnaires came back, officials were surprised to see that the answers were quite varied. The most common responses appeared to be 'crocodile', 'not today' and 'windy'. Some of the questionnaires were returned with pictures of animals, spaceships and motorbikes drawn in crayon, and some of the more imaginative examples had been folded into paper aeroplanes or hats. At least one of the forms appeared to have been partially regurgitated, and several more were smeared with substances that have still not been identified, despite extensive laboratory testing. As a result of this survey, the North American Milliners' Association has now conceded that many of its members are significantly more mad than they'd previously given them credit for.